This study describes the development of Response Surface Pathway (RSP) design, assesses its performance and effectiveness in estimating LD50, and compares RSP with Up and Down Procedures (UDPs) and Random Walk (RW) design. A basic 4-level RSP design was used on 36 male ICR mice given intraperitoneal doses of Yessotoxin. Simulations were performed to optimise the design. A k-adjustment factor was introduced to ensure coverage of the dose window and calculate the dose steps. Instead of using equal numbers of mice on all levels, the number of mice was increased at each design level. Additionally, the binomial outcome variable was changed to multinomial. The performance of the RSP designs and a comparison of UDPs and RW were assessed by simulations. The optimised 4-level RSP design was used on 24 female NMRI mice given Azaspiracid-1 intraperitoneally. The in vivo experiment with basic 4-level RSP design estimated the LD50 of Yessotoxin to be 463 μg/kgBW (95% CI: 383–535). By inclusion of the k-adjustment factor with equal or increasing numbers of mice on increasing dose levels, the estimate changed to 481 μg/kgBW (95% CI: 362–566) and 447 μg/kgBW (95% CI: 378–504 μg/kgBW), respectively. The optimised 4-level RSP estimated the LD50 to be 473 μg/kgBW (95% CI: 442–517). A similar increase in power was demonstrated using the optimised RSP design on real Azaspiracid-1 data. The simulations showed that the inclusion of the k-adjustment factor, reduction in sample size by increasing the number of mice on higher design levels and incorporation of a multinomial outcome gave estimates of the LD50 that were as good as those with the basic RSP design. 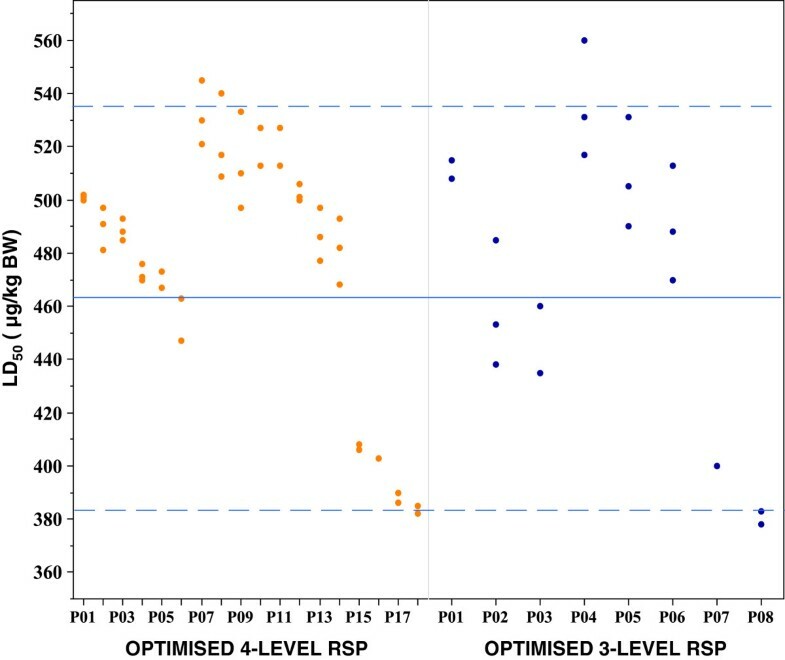 Furthermore, optimised RSP design performed on just three levels reduced the number of animals from 36 to 15 without loss of information, when compared with the 4-level designs. Simulated comparison of the RSP design with UDPs and RW design demonstrated the superiority of RSP. Optimised RSP design reduces the number of animals needed. The design converges rapidly on the area of interest and is at least as efficient as both the UDPs and RW design. In recent years, acute toxicity studies have been refined to improve animal welfare. In particular, LD50 studies are no longer the method of choice in toxicology studies associated with pharmaceutical drug development, or the development of food additives, flavourings, contact materials and cosmetics . In some areas, however, LD50 studies cannot yet be replaced by other methods. There is an urgent need for alternative methods, both for ethical reasons and because of the shortcomings of the bioassays, in particular their sensitivity and specificity. In vitro methods have been recommended by international expert groups . However, before these can be adopted information on the relative toxicities of all relevant analogues in each toxin group must be obtained, in order to establish toxic equivalency factors (TEFs) . The TEF approach was initially developed to estimate the potential toxicity of mixtures of dioxins, dibenzofurans and PCBs [4–6]. TEF studies of marine algal toxins are based on LD50 studies in mice . Ideally, these studies should be performed by exposure via the oral route. However, due to the scarcity of pure toxins in sufficient quantities, LD50 studies are performed by intraperitoneal (IP) injections in mice . Until laboratory animal studies can be replaced completely, it is of the utmost importance to optimise trial design, in order to reduce the number of animals used for this purpose . The classical LD50 design introduced by Trevan in 1927 requires the use of a large number of animals . The design has been criticised for both ethical and scientific reasons [10, 11]. The Organization for Economic Cooperation and Development (OECD) removed the classical LD50 (OECD 401) from their acute oral toxicity guidelines in 2002  and recommended OECD 425, the Up and Down Procedure (UDP) to optimise LD50 design . The UDP is a sequential procedure that results in rapid convergence on the area of interest, the dose for each animal being adjusted up or down depending on the outcome for the previous animal. This approach was established in 1948  and Bruce proposed the use of the UDP for determination of acute toxicity to chemicals . The UDP in the OECD guidelines uses a calculated dose progression factor based on the antilog of 1 divided by the estimated slope of the dose–response curve and should stay constant during testing. Single animals are dosed until one of three criteria to stop the trial is met . The OECD’s UDP can only estimate the point of interest and cannot be used to construct a dose–response curve . Furthermore, the single-animal strategy does not take into account inherent biological variation, or the practical problems that arise from having to test each mouse individually. Tsutakawa introduced a block up and down method known as Random Walk (RW) , where every sequence used more than one mouse. This design reduces the number of trials and adds flexibility. The experiment starts with n observations on a given level d j and continues with n observations, with the dose determined by a procedure for generating the sequences. In the field of engineering, the term Response Surface is commonly used to obtain the optimal value for one response variable. By combining the philosophy of UDP and the principles of Response Surface methodology  the basic Response Surface Pathway (RSP) design was created. m i = m i − 1 ± m 2 i − 1 where m i − 1 denotes the dose used on design level i − 1 . The pathway obtained in the in vivo Yessotoxin study using the basic 4-level RSP design. The basic 4-level RSP design in in vivo Yessotoxin study used 9 mice on each design level with the binomial outcome. The pathway obtained is indicated by dashed line. The doses are given in μg/kg BW and the numbers given in brackets are the ratios of dead mice. This basic RSP-design has previously been used in toxicity studies to estimate LD50 with satisfactory results [18, 19]. However, these studies used a large amount of animals and did not describe in detail the rationale behind the dose steps. Using the data from one of these studies , the concept of RSP has been refined and developed using simulation procedures. The aims of this paper were to introduce and describe the optimisation of RSP design, to assess its performance and effectiveness in estimation of LD50 and to compare it with UDPs and RW design using simulations performed on data from an in vivo experiment. The first in vivo study has been described in detail previously , and comprised 36 male ICR mice of SPF quality (16-20 g) divided into 4 equal groups. The study was conducted in 2006 and was authorized by the Norwegian Animal Research Authority, in accordance with the Norwegian Regulation on Animal Experimentation. The mice were given Yessotoxin (YTX) IP at varying concentrations with a predefined LD50 dose window of 100–700 μg/kg body weight (BW). The outcome variable was “death” within the 24 hours after injection. Simulation study: All the simulation studies used the LD50 of YTX derived from the material in the in-vivo study to estimate the probability of death at a given dose. The second in vivo study consisted of 24 female NMRI mice of SPF quality (15–21 g), randomly divided into 4 groups comprising 3, 5, 7 and 9 mice per cage, respectively. The mice were supplied 1 week before the experiment for acclimatisation purposes. They were housed on aspen bedding in standard macrolone cages on a 12:12 light/dark cycle at 21-23°C with food and water available ad libitum. The mice were nulliparous and were not fasted before treatment. Injection volumes were adjusted for bodyweight to 1 mL/20 g BW. The animals were observed for 24 hours after injection. Symptoms and time to death were recorded. The study was conducted in 2011 with the authorization of the Norwegian Animal Research Authority, application number FOTS ID: 1132), in accordance with the Norwegian Regulation on Animal Experimentation. The mice were given Azaspiracid-1 (AZA1) IP in four different concentrations with a predefined LD50 dose window of 25 - 375 μg/kg BW. The outcome variable was the number of dead mice within 24 hours after injection. Some prior information about the toxicity range is always available, and can also be obtained by educated guesswork. The study can then be focused on the area of interest, thereby increasing the amount of useful information and the efficiency of animal use. In basic RSP design, no attention is paid to upper or lower doses. Let D U and D L denote the upper and the lower limits of the dose window, respectively. The basic RSP design uses an equal number of animals on each design level. The starting dose is either based on an educated guess or on the mid-dose of the dose window. Due to the structure of the design, it is likely to approach the parameter in question with increasing design level. It is therefore unnecessary to use the same number of animals at the starting dose as on the highest design level. By using the lowest possible number of animals at the starting dose and increasing the number at increasing design levels, the total number of animals needed will be reduced without loss of information. One practical solution is to use three animals on the first level, five on the second, seven on the third, nine on the fourth, and so on. In toxicological studies the most common outcome variable is binomial. In the determination of the LD50, the outcome is "dead" or "alive" after a certain time interval. The decision to either increase or decrease the dose on the next design level is based upon whether there were more or less than 50% dead animals on the previous level. However, there is clearly a difference between outcomes where 0, 1, 2 or 3 animals die. It is reasonable to assume that by changing the outcome variable from binomial to multinomial, the amount of information obtained will increase. The binomial outcome variable can be replaced by "the number of dead animals". If none of the animals die, the toxin dose can be increased maximally on the next level. Conversely, if all the animals die on a given level, an equally large decrease in the dose is performed (Table 1). The dose m = m1 is the starting dose. The number of mice used on the design levels was 3, 5, 7 and 9, respectively. Simulation of all the four designs was performed on the first in vivo material. The 3-level RSP with multinomial outcome was performed with 3, 5, and 7 mice on design levels 1, 2, and 3 respectively. The k-adjustment factor in the 3-level situation was calculated to be 2. The UDP simulation was performed using OECD 425 guidelines . The LD50 of YTX was assumed to be 400 μg/kg BW with a sigma of 0.25 μg/kg BW and a progression factor of 1.78. The same dose sequence and starting dose for OECD’s UDP was used in both simple UDP and RW design, which use 3 mice on each level. The dose was decreased if more than 50% mice died, and increased if less than 50% mice died. If no mice died in the RW design, the dose was increased. If more than 2 mice died, the dose was reduced. If one mouse died, a coin was tossed to decide whether to increase the dose or stay at the same dose. The starting dose was 225 μg/kg BW and the simulations were halted when a total of 15 animals had been included. The YTX in vivo study was used to estimate the probability of death at a given dose using logistic regression in a binomial distribution. A total of 10,000 simulated mice samples were generated for each dose. The simulation procedure was repeated 10 times and the average of the 10 outcomes was used as the simulated result. The same procedure was also carried out to compare 3-level RSP Design, UDPs and RW Design. Three pathways within the RSP design were considered to assess its performance, with binomial outcome, k-adjustment factor and either the same number of animals at each design level or increasing numbers at increasing design levels, respectively. For the optimised 4-level RSP design with multinomial outcome, k-adjustment factor and increasing numbers of mice at increasing design levels, eighteen pathways were created, but only four are of interest. When assessing the performance of optimised 3-level RSP design with multinomial outcome, k-adjustment factor and increasing number of mice with increasing design level, eight pathways were created. As in the previous simulations, the probability of dead mice at a given dose was estimated using logistic regression in a binomial distribution from the YTX in vivo study. For each scenario, the mean number of dead mice at the assigned dose in 10,000 simulations was recorded and the outcome was used to simulate the number of dead mice at each design level. The results are expressed with 95% confidence intervals (CIs) using isotonic regression  and trimmed Spearman-Karber regression estimation . The isotonic regression was performed using the pooled adjacent-violators algorithm (PAVA) . The CIs were obtained using parametric bootstrap numerical methods . The trimmed Spearman-Karber program originated from Montana State University and was modified at the Duluth and Athens National Exposure Research Laboratories . The LD50 in OECD’s UDP was analysed by Maximum Likelihood Estimation (MLE) using AOT425 software . Three of the nine mice at the starting dose of 400 μg/kg BW died and the dose for the second design level was increased to 600 μg/kg BW (Figure 1). This resulted in the death of five of nine mice, which resulted in a dose of 500 μg/kg BW on the third design level. On this design level, seven of nine mice died and the dose for the fourth design was decreased to 450 μg/kg BW. Four of nine mice died on the fourth and last design level. Based on the data obtained, the LD50 of Yessotoxin was estimated to be 463 μg/kg BW (Table 2). The results are expressed with 95% Confidence Intervals. *) Simulated data based on the 36 observations in the basic RSP model. The k-adjustment factor of 2.21 was calculated to ensure that the design covered the total predefined dose window (Figure 2). Of the nine simulated mice given 400 μg/kg BW, three died and the dose for the second design level was increased to 581 μg/kg BW. On this design level, five mice died and the dose for the third design level was decreased to 499 μg/kg BW. The simulated results on this design level again resulted in five dead mice and the dose for the fourth and last design level was set to 462 μg/kg BW. Four of the nine mice died. Based on these simulated data, the LD50 was estimated to be 481 μg/kg BW (Table 2). Simulated Yessotoxin studies using 4-level RSP designs with k-adjustment factor with fixed and increasing number of mice. The simulated Yessotoxin pathways obtained in the two 4-level RSP designs. The pathways obtained are shown by dashed line. The doses are given in μg/kg BW. The first design incorporates binomial outcome, k-adjustment factor, and 9 mice at each design level, where the ratios of dead mice are given in bracket. The second design incorporates binomial outcome, k-adjustment factor and increasing number of mice from 3 at the first level to 9 at the fourth, where the ratios of dead mice are given in square brackets [ ]. Of the three mice assigned to the first design level given 400 μg/kg BW, one died (Figure 2). The dose for the second design level was increased to 581 μg/kg BW and five mice were included. Four of these five died and the dose for the next design level was reduced to 499 μg/kg BW. Of the seven mice on this third design level, five died, which led to a reduction to 462 μg/kg BW for the fourth design level. Nine mice were simulated on this level and 5 died. Based on these simulated data, the LD50 was estimated to be 447 μg/kg BW (Table 2). Three mice were assigned in the simulation to 400 μg/kg BW on the first design level and one died (Figure 3). The dose for the second design level was increased to 482 μg/kg BW and three of the five mice died. Consequently, the dose was decreased to 465 μg/kg BW and three of the seven mice died. The dose for the fourth design level was increased to 468 μg/kg BW and four of nine mice died. Based on the simulated data, the LD50 was estimated to be 473 μg/kg BW ( Table 2). The obtained pathway in the simulated Yessotoxin study using the optimised 4-level RSP design. The optimised 4-level RSP design incorporates multinomial outcome, used k-adjustment factor and increasing number of mice with increasing design levels, and the pathway obtained in the simulation study is shown by dashed line. The doses are given in μg/kg BW and the numbers in the callouts represent the ratios of dead mice. The estimated LD50 of YTX with a 95% confidence interval obtained in vitro was used as the reference in evaluation of the simulated results of the three RSP designs. 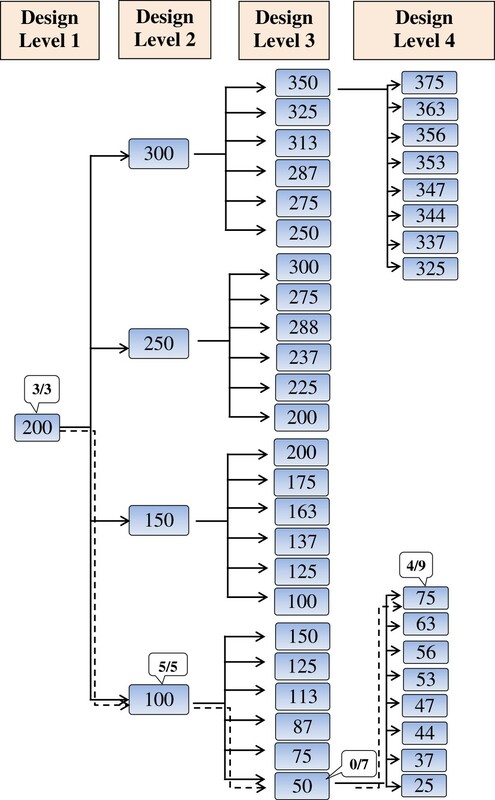 For pathway 01 (Table 3), 24 and 10 scenarios, respectively were created for the 4-level RSP designs with binomial outcome, k-adjustment factor and nine mice on each design level or with increasing number of mice from three on the first level to nine on the fourth. For both of these two RSP designs, all the estimated LD50 deviated with a maximum of 10% from the in vitro reference. The estimated LD50 from pathway 02 was higher than the reference value. For the RSP design with binomial outcome, k-adjustment factor and nine mice at each level, three of the 12 scenarios deviated with a maximum of 10% from the in vitro reference. By increasing the number of mice from three on the first design level to nine on the fourth, two of six scenarios fulfilled the same demands. All the scenarios in pathway 03 estimated the LD50 to be below the in vitro reference value. 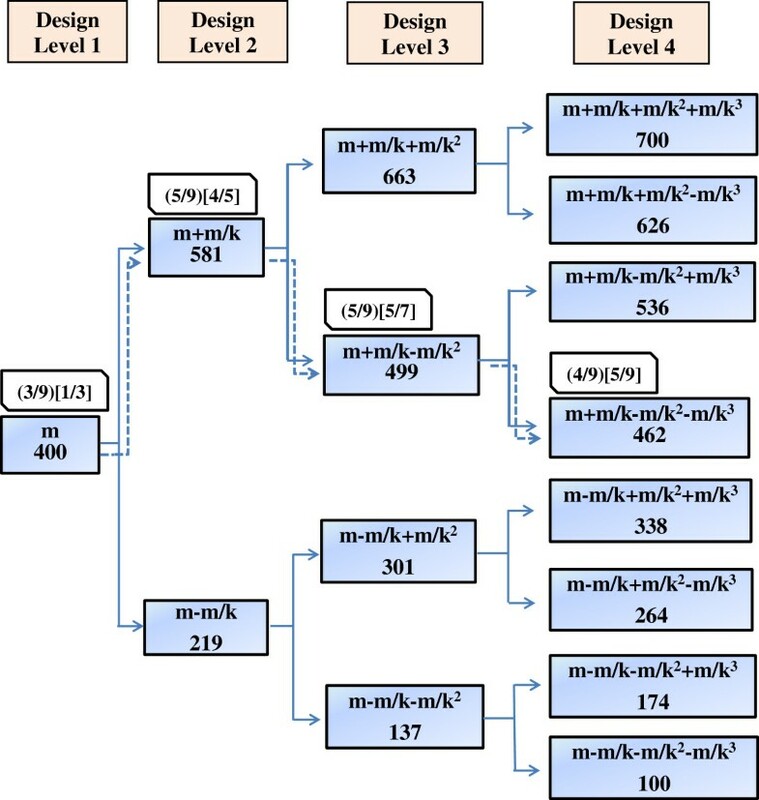 Simulation of the optimised 4-level RSP design with multinomial outcome, k-adjustment factor and increasing numbers of mice from three to nine on the last level, estimated the LD50 in 11 of 18 pathways with a deviation of at most 10% from the in vitro reference (Figure 4). The results are expressed with 95% Confidence interval. 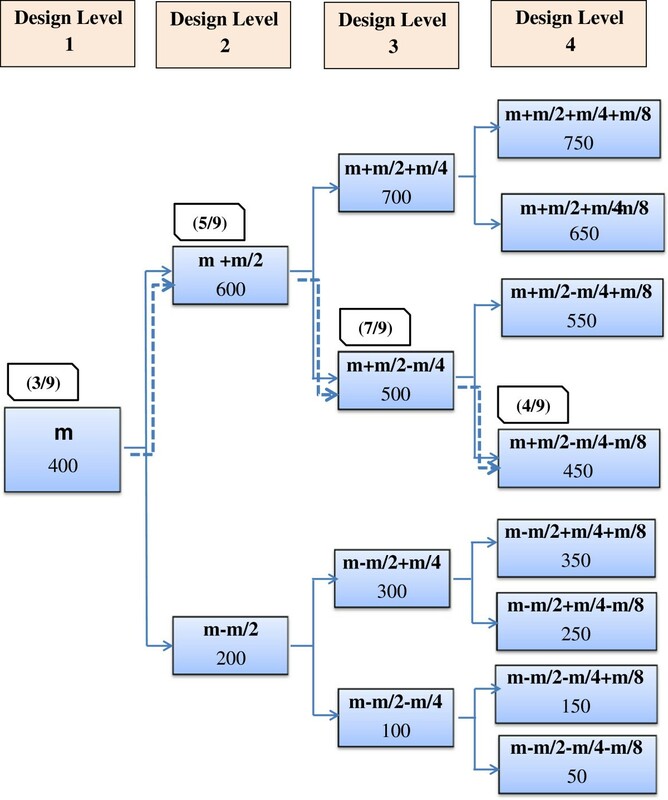 M represents the mean of dead mice based on 10,000 simulations on the assigned dose. The estimation of LD 50 using the optimised 3- and 4-level RSP designs. The optimised 3-level and 4-level RSP designs incorporate multinomial outcome, using k-adjustment factor and increasing number of mice with increasing design levels. 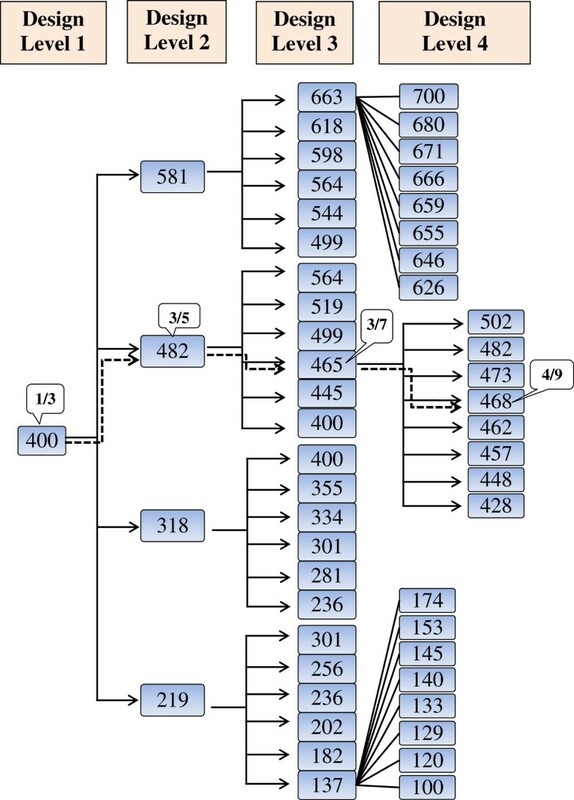 The numbers of pathways are given along the x-axis, where the orange dots represent estimated value for 4-level RSP design and blue dots estimated value for 3-level RSP design. Comparison of the optimised 3- and 4-level RSP design resulted in similar estimation of LD50 (Figure 4). A total of eight pathways were formed with the optimised 3-level RSP design and the estimated LD50 deviated with a maximum of 10% from the in vitro reference in 50% of the cases. Three mice were given the starting dose of 200 μg/kg BW and all died within 24 hours (Figure 5). In accordance with the design, the dose for the second design level was decreased to 100 μg/kg BW, but all five mice died. The dose for the third design level was decreased to 50 μg/kg and all seven mice survived 24 hours after the injection. By only including data up to the third level, the LD50 of AZA-1 was estimated to be 76.3 μg/kg BW and 70.7 μg/kg BW using isotonic regression and the Spearman-Karber method, respectively. For the fourth design level, the dose was increased to 75 μg/kg BW, where four of the nine mice died. Inclusion of all four design levels resulted in estimation of the LD50 of AZA1 to be 77.5 μg/kg BW (95% CI: 68 – 88 μg/kg BW) using isotonic regression and 74 μg/kg BW (95% confidence interval: 66 – 83 μg/kg BW) using the Spearman-Karber method. 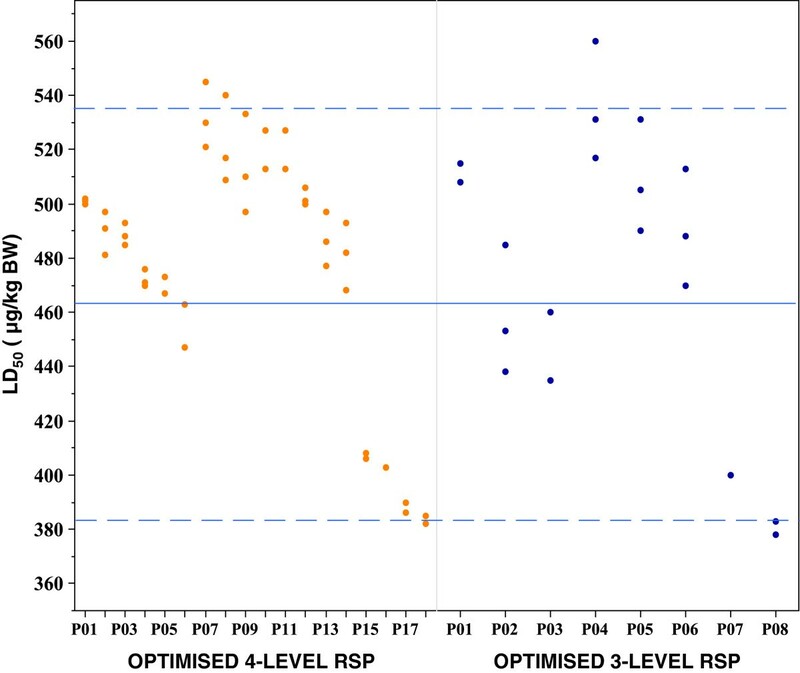 The obtained pathway in the in-vivo Azaspiracid-1 study using the optimised 4-level RSP design. The optimised 4-level RSP design incorporates multinomial outcome, using k-adjustment factor and increasing number of mice with increasing design levels, the pathway obtained is shown by dashed line. The doses are given in μg/kg BW and the numbers in the callouts represent the ratios of dead mice. In the 3-level RSP design, three mice were given a starting dose of 400 μg/kg BW (Table 4). One of the three mice died and 500 μg/kg BW was then given to 5 mice. Three of the 5 mice died and the 7 mice on the third design level were given 475 μg/kg BW. Four of the seven mice died and the LD50 of YTX was estimated to be 453 μg/kg BW. The length of the CI was 133 μg/kg BW. The results are expressed with 95% Confidence Intervals. The simulation of OECD’s UDP was started by including one mouse given a dose of 225 μg/kg BW. The mouse survived. The next mouse was assigned to 400 μg/kg BW and survived. The third mouse died at 710 μg/kg BW and the dose was then decreased again to 400 μg/kg BW. The fourth mouse survived this dose and the fifth mouse was given a dose of 710 μg/kg BW. The fifth mouse died and the dose for the next mouse was decreased again to 400 μg/kg BW. This sixth mouse survived. The study was stopped after six mice since one criterion for this had been met and the LD50 was estimated to be 400 μg/kg BW (Table 4). The length of the CI was 779 μg/kg BW. In the simple UDP, none of three mice given a starting dose 225 μg/kg BW died. In the second simulation sequence a dose of 400 μg/kg BW was given and 2 of 3 mice died. The dose was decreased to 225 μg/kg BW and all the mice survived. Consequently, a dose of 400 μg/kg BW was again assigned and one of 3 mice died. The dose was then increased to 710 μg/kg BW and 2 of 3 mice died. In the RW design, three mice were given a dose of 225 μg/kg BW and all survived. In the next sequence, three mice were allocated a dose of 400 μg/kg BW and two mice died. The dose was decreased again, and three mice survived at 225 μg/kg BW. The dose was again increased to 400 μg/kg BW and one of 3 mice died. A coin was tossed to decide whether to increase or stay at the same dose: the dose was increased to 710 μg/kg BW and 2 of 3 mice died. The LD50 of YTX was estimated to be 400 μg/kg BW both in the simple UDP and RW design (Table 4), and the length of the CI was 514.8 μg/kg BW. Comparison of the four designs showed that OECD’s UDP, simple UDP, and RW design resulted in CIs that were 4.9, 2.9, and 2.9 times larger, respectively, than the RSP design. When designing a classical LD50 study, the dose window is divided into fixed dose intervals of equal range that cover the dose window. In the present example with a dose window of 100–700 μg/kg BW, the classical LD50 study with four dose levels would entail the same number of animals being assigned to doses of 100, 300, 500, and 700 μg/kg BW, respectively. A comparison of the classical LD50 design and RSP design demonstrates the strength of RSP. Only one of the doses chosen for a classical LD50 study is close to the real LD50. In the present study where the LD50 was estimated from the basic RSP design and the four simulated studies using optimised RSP design, the dose assignments ranged from 400 to 581 μg/kg BW. The lowest dose assigned, which was in the simulation of 4-level RSP design with k-adjustment factor, a fixed number of mice on each design level or increasing numbers with increasing design level, was 218 μg/kg BW. However the probability for assigning this dose in real life is minimal. Assigning doses based on the number of dead animals, as was done in the optimised RSP design, gave an opportunity to allocate a more appropriate dose. To our knowledge, no rational procedure for choosing the size of the increase or decrease in dose has been described for UDP and the change in dose is the same regardless of the dose level. OECD recommends that the dose adjustment or progression factor in UDP design is based on the estimated slope of the dose–response curve and should remain constant throughout the test. If no information about this slope is available, a constant adjustment factor of 3.2 should be used . In the basic RSP design an attempt is made to solve this problem by using a fixed but chosen dose adjustment factor of 2. Moreover, the size of the increase and decrease in dose depends on the design level. Toxicologists have quite often a predefined dose window for the toxin to be investigated. By using a chosen dose adjustment factor or predefined incremental procedure, doses outside the dose window are less likely to be included. This may reduce the amount of information in the basic RSP design and result in failures. In order to increase the power of the basic RSP design, the fixed dose adjustment factor of 2 has therefore been amended in our study to an adjustment factor k dependent upon the predefined dose window. This factor is related to the number of levels in the design and is calculated by a simple procedure to ensure that all the values in the dose window will be covered. Intuitively, this will increase the power of the design, even though this was not clearly demonstrated by the results of the simulations in the present study. The choice of the middle of the dose window as a starting point is based on an assumption that this dose is more likely to be the LD50. Using the mid-dose and the procedure for calculation of the k-adjustment ensures both the upper limit (DU) and the lower limit (D L ) of the dose window will be covered. The predefined dose window for AZA toxin was 25–375 μg/kg BW. No information was available on where in the window the value of LD50 was likely to be. The LD50 was assumed to be 200 μg/kg BW. However, the true LD50 turned out to be close to the lower part of the dose window. The design made a pathway directly to the area of interest after inclusion of only 3 animals. The number of animals used in these studies was quite small. Maximum Likelihood Estimation (MLE) does not seem to be suitable in design analysis when the sample size is small . The Trimmed Spearman-Karber method , which was used in the present study, requires at least one mortality rate that is less than or equal to 50% and at least one that is greater or equal to 50%. This method is recommended because it is freely available and it is a simple program for those who are not highly skilled in statistical analysis. Non-parametric modified isotonic regression may be a more optimal method and is recommended for small samples . It is slightly more complicated, but can easily be calculated manually. Furthermore, this method assumes that the chance of toxicity does not decrease over the set of possible dosages. The analysis of the present data gave similar results with these two statistical methods. A reduction in the number of laboratory animals is a central aim of UDPs, RW and RSP design. The UDP  actually recommends that only one animal is used on each dose level. The single-animal strategy used in OECD’s UDP might at first sight appear advantageous in reducing the number of animals in the study, but it does not take into account the inherent biological variation in an animal model. The probability of changing the dose on the next level in the wrong direction is high and may affect the study. Simple UDP and RW address this problem by including more than one animal on each level. As in the simple UDP and RW design, basic RSP-design uses more than one animal, with equal numbers on each dose level. Due to the structure of the design, the dose always converges on the end result with increasing dose level. It seems therefore apparent that it is unnecessary to use the same number of animals at the starting dose as on the last dose level. By using the lowest possible number of animals at the starting dose and increasing the number of animals on increasing dose levels, the total number of animals will be reduced. In order to avoid the problem of biological variation that is not addressed in OECD’s UDP, the procedure should be to start with 3 animals at the first dose level and continue with 5, 7 and 9 animals, respectively, on subsequent levels. This reduces the total number of animals from 36 to 24. The present simulation indicated that the ability of the modified RSP designs to estimate LD50 values was equally good as the basic RSP design. A large disadvantage of most of the designs that have been proposed for this area is the binomial outcome variable. So far, this has also been the case for the basic RSP design. However, the decision variable can easily be changed from "more or less than 50% dead mice" to “the number of dead mice”. If none or only one of the three mice on the first design level dies, the dose for the next design level has to be increased, otherwise it is decreased. A similar procedure is used on the next design level. The simulation of this procedure in the present paper clearly demonstrated a substantial increase in the power of the RSP design. From the simulated results it seems that the increase in information in the model is so large that the fourth level of the design can be omitted. The number of animals can therefore be reduced from the initial 36 in the basic RSP design to 24 by including the k-adjustment dose factor and by increasing the number of animals at increasing design levels. The simulation results also indicated that the optimised 3-level RSP design estimated the LD50 as well as all the other 4-level RSP variants. By reducing the number of levels in the design from 4 to 3, only 15 animals are needed. The optimised RSP design created more pathways, estimated LD50 slightly higher and performed better than the other two RSP designs. The RSP design should be performed sequentially and the dose to be used on the next design level is not available until the experiment on the previous level has ended. This may result increase the duration of the study as a whole. Furthermore, experimental conditions such as the weight of the animals, the composition of the test compound, variations in the time to death and environmental factors may differ between design levels and influence the results. A reduction from four to three design levels is therefore an advantage for many reasons. The complete optimised RSP design was used in the AZA1 toxicity study. In this experiment, the predefined dose window of AZA1 was quite large and the dose used on the first design level proved to be far from the end result. The study demonstrated the power of the design and that the area of interest was already detected by the third design level. This underlines the fact that the fourth design level of the 9 mice was not needed and 15 mice would have been sufficient. If the AZA1 study had been performed using optimised 3-level RSP design, the k-adjustment factor would have been 1.78 and the estimated LD50 would not have been different from the value estimated by using the optimised 4-level RSP design. In order to simulate an optimal 3-level RSP for estimation of the LD50 of AZA1, the results obtained in the prospective 4-level study were used. All the three mice at the first design level died, which led to a dose of 88 μg/kg being assigned on the second level, where 3 of 5 mice died. The dose for the third design level was then reduced to 68 μg/kg and 3 of 7 mice died. This simulation estimated the LD50 of AZA1 to be 76.3 (95% CI: 38.5 - 101.58) and 75.7 μg/kg BW (95% CI 49.4 – 116.2) using isotonic regression and the Spearman-Karber method, respectively. The confidence intervals were, as expected, larger compared to those in the prospective 4-level RSP design study, but they still support the use of only 3 dose levels. The simulated comparison between 3-level RSP, UDPs and RW design showed that the RSP reduced the number of study sequences compared to the other two designs. One way of comparing the information from the three designs is to compare the length of the CI for the parameter in question. If this is done, the RSP design was clearly superior to both the RW and the UDPs. Both the simulation and the results from the AZA1 study showed that the RSP designs rapidly converge on the area of interest. The RSP design was found to increase the information that could be obtained and it was possible to develop a dose–response curve. The optimized 3-level RSP-design has recently been used in two other studies (manuscripts in preparation). However, further studies are needed to confirm the performance of the 3-level RSP design. The dose to be used on a given design level in the RSP design is derived mathematically and may in some cases be impossible to titrate or administer in the laboratory. In these cases the dose must be adjusted to the nearest practicable value. The determination of LD50 in the present paper was merely used to demonstrate how the RSP design was optimised. The designs can also be used to estimate the LDX, where 50% is replaced by x%. This design can also be used in other areas of medicine. The most relevant of these may be dose-finding studies, but the RSP design is also applicable to studies where the primary aim is estimation of quantile response. The RSP is a sequential design, which can reduce the number of animals needed to a minimum without loss of information. The design takes into account the variation in response between animals, using prior knowledge and information obtained during the study and it converges rapidly on the area of interest. It is as least as efficient as both the UDPs and RW designs. The authors wish to thank Meabco AS for financial support, Prof. Steen Lindkaer-Jensen for scientific advice and Brit Heidenreich for technical assistance with the animal experiments. The in vivo part of the project was financed by the Norwegian Research Council (NFR), project nr 172561/S40 and support was also obtained from the ASTOX2-project (Grant-Aid Agreement No PBA/AF/08/001(01)) under the Sea Change strategy with the support of the Irish Marine Institute and the Marine Research Sub-Programme of the National Development Plan 2007–2013, co-financed under the European Regional Development Fund. All the authors participated in development of the manuscript. The Response Surface Pathway design has mainly been developed by SD and SL who also performed the statistical analyses and wrote the initial draft of the manuscript. The laboratory work was performed or designed by AS, TA and JAAB. All the authors have participated in the literature review and development of the manuscript, and have approved the final version.